Qualifications: Wilderness and Water Search. Notes: As a puppy, Hero was flown from Missouri to Reagan International Airport. Then a small ten-week old pup with floppy ears, he grew to be a 95 pound impressive looking canine. David and Hero were certified in wilderness airscent searching since 2003 and water recovery work as well. 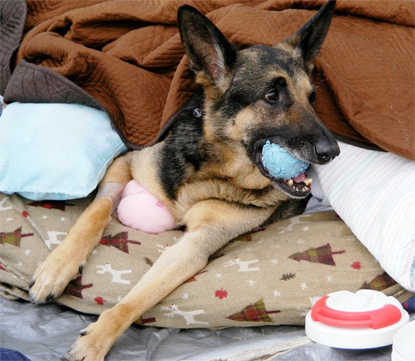 Hero broke his femur in half when he was only two years old, and he would set of metal detectors when he went through them due to the metal plate and screws in his leg. Hero participated in a huge number of demonstrations at camps, scout meetings, fire station open houses, church functions, county fairs, and other events. David and Hero educated kids how not to get lost in the woods, what to do if they ever end up lost, and demonstrate Hero's agility, obedience, and searching abilities. David and Hero responded to countless searches in Virginia, and, as well, have responded to searches in West Virginia, Maryland, Pennsylvania, and North Carolina. 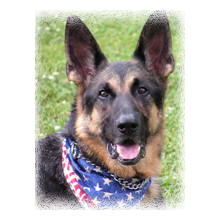 Hero also came in 1st Place at the Virginia Police Working Dog Associations Iron Dog in the SAR category in 2005. Hero sadly passed away in 2008, surrounded by family and friends, due to cancer. I got him at ten weeks of age. It took him 4 years to become certified. He was certified for 4 years and 2 months. We responded to 34 searches together. He found one missing person. We attended 5 NASAR Conferences and 6 ARDA Weekends. CFC - Selective Service Branch, Washington D.C.
CFC - Dept of Commerce, Washington D.C.
CFC - Nuclear Safety Branch, Washington D.C.
CFC - FCC, Washington D.C.
Maury Elementary School, Washington D.C.
CFC - FEMA, Washington D.C.
CFC - Dept of the Interior, Washington D.C.
Inaugural Day Parade, Washington D.C. He was an honorary member of a Cub Scout troop. He watched both Scooby-Doo movies in the theaters. He kayaked with the dolphins. He once had his own website. He met Cooter from the Dukes of Hazzard and sat in the General Lee. He flew on planes 6 times. His first flight was from Missouri to D.C. at 10 weeks of age. He rode the Trolleys in San Francisco, the metro in Boston, and the bus system in Texas. He competed in two Virginia Police Work Dog Association Iron Dog competitions, taking 1st place in the SAR category one time. He had more nicknames than can be counted. He enjoyed chomping ice, swimming, and digging in the sand. He loved tennis balls, bubbles, snow and picking up rocks and moving them. He cost $2,500 from the breeder. $4,822 was spent on supplies, toys, food, vet and SAR in all of 2007. $4,800 was spent in his last week alive. He died on the shore of the Potomac, looking out into the water and the morning sun after a few chomps on his ball and bubbles, surrounded by friends, on February 10th, 2008.